There are 3 certainties in life: death, taxes, and a yearly update to EA’s college football franchise. NCAA Football 10 is the ONLY fully licensed NCAA football game, which at times can be both a gift and a curse. It’s a gift because EA is practically in bed with ESPN, which helps with the polish of the overall presentation of the game. What makes it cursed is that again, it’s the ONLY fully licensed NCAA football game, and since there isn’t any competition out there, EA doesn’t have to do too much in the way of innovation, making the overall experience quite bland. All of your favorite game types return, as NCAA Football 10 doesn’t skimp by providing many different play modes in the game. Much like it’s professional football counterpart (Madden) all the modes are quite deep and entertaining. Fantasy football junkies beware; this game will deprive you from most if not all sunlight this summer. Dynasty mode is fun as usual, and it will have you up all night restless and wracking your brain just trying to figure out what blue-chip prospect(s) to recruit to help catapult your team and school to greatness. For as much as it has to offer Dynasty mode IMHO doesn’t come close to (this year’s version of Campus Legend) “Road to Glory” mode, where YOU are the blue-chip prospect and schools are competing for your commitment. It starts out during the High School State Championship playoffs, where you get to show off your goods for all the college recruiters in hopes of being offered a spot on a team for the upcoming school year. The better you do, the more offers you get. If you’re an exceptional player you’ll get offers to start as a freshman, which may sway your decision into attending a particular school. What’s cool about the RTG mode is that you only play your position while everything else is simulated. If you’re an offensive player, and you don’t want to simulate while your team is on defense you can chill out and watch the game from the sidelines until it’s your turn to get back out there. During the week you have practice, weight room sessions, and even class (you are a student athlete for crying out loud). All the different things you do throughout the week are applied to your attributes. So if you burn it down in the weight room, but don’t go to class you’ll be faster and stronger, but your awareness stays the same. It’s almost like adding RPG elements to a sports game, because whatever action you do, helps you level up in one way or another. 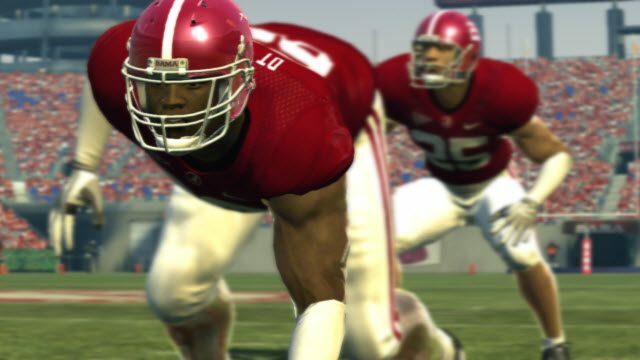 This is bar none the best and most immersive feature you’ll find in NCAA Football 10. 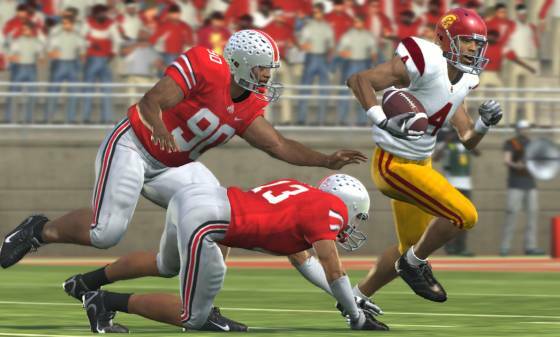 In the graphics department NCAA Football 10 doesn’t look that much different than 09, or 08 for that matter. The character models are only slightly more detailed, yet the stadium and the crowd have not seen any improvement at all. In all seriousness the crowd looks like something out of the SNES, pixilated and flat. I played it on the PS3, which by now most of you should know that previous iterations of the series have had frame rate issues on Sony’s platform. No need to worry this time around because NCAA Football 10 IS running at 60 frames per second (on the PS3)… just not all the time. While the ball is in play, visuals are all well and good; the action going on in between plays however is another story. This is where the game suffers many noticeable dips in frame rates. It’s quite unfortunate that frame rates are still a crippling issue 4 years into this current generation of consoles. My question is would NCAA Football 10 or even Madden, have these lingering problems if there were any actual competition? We’ll save that topic for a later date, moving on! The sounds in the game are quite authentic and full of all your favorite college marching band anthems and school fight songs. As accurate as the sounds are though, the sound design itself is a little uninspired. It feels as though crowd noise from last gen to now hasn’t really changed that much besides having the ability to get louder or softer when either pumping up or quieting down the crowd. Corso and Herbstreit are on the money with their commentary, but can get repetitive. I think after about 10 games or so, I’ve heard just about everything it is that those two have to say. The sound isn’t bad; it just isn’t anything to write home about either. It’s unfortunate that EA doesn’t try harder in providing a more dynamic and exciting 5.1 surround sound experience. The online component has also made its yearly return. With it comes some good old ESPN integration, so as soon as you sign in you’re greeted with a condensed Sportcenter, with real-time update and real world sport scores and news. Besides the usual lobbies and quick play, there is also an Online Dynasty mode. My experiences online were mediocre at best. There’s something about sports games just never playing as well as other genres online. No matter how close your opponent is, or how good your Internet connections are, there’s still always some sort of delay. That delay can get quite frustrating, especially if you play the game like me. I run the option like its going out of style, and I run it well. The problem is when I have to worry about sticky/laggy controls on top of the linebackers and d-backs trying to pummel me, its simply unacceptable. Network issues should be at the top of EA’s priority list for next year. There’s no reason why 2 consoles can’t connect and have a lag free match, especially when all the FPS’ today have 16+ players running around shooting each other without so much as a hic-cup. 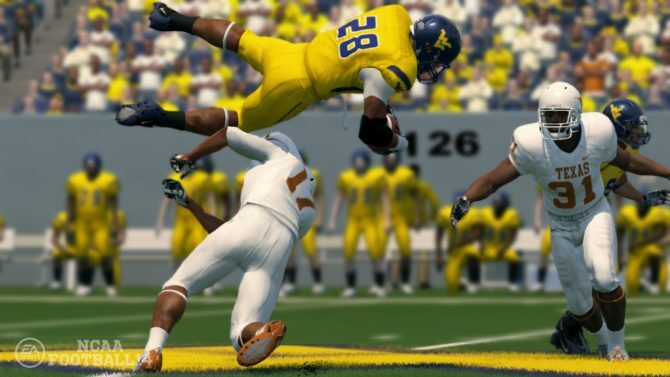 In closing, I can’t say NCAA is a bad game; it just hasn’t done enough new things to make it an exceptional one. 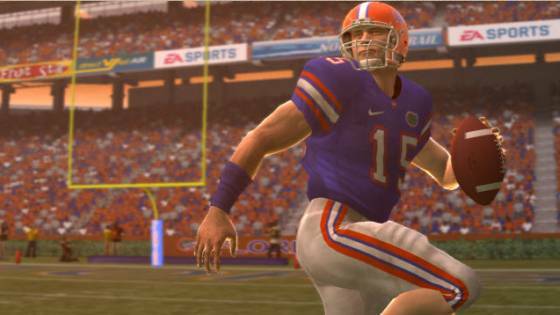 Being the only NCAA football game hasn’t really helped the series evolve or innovate much. Sure you’ll get the newest rosters, and a couple new animations, but that’s really just it. If you’re a fan of college football then picking this up is a no-brainer, but just don’t expect to be floored because NCAA Football 10 is just more of the same. Play Xbox + PlayStation Games and Make Ca$h! Get lucky on Live with NCAA Basketball 10 Demo!